The Eastern Cape is a province of South Africa. Its capital is Bhisho, but its two largest cities are Port Elizabeth and East London. It was formed in 1994 out of the Xhosa homelands of Transkei and Ciskei, together with the eastern portion of the Cape Province. Landing place and home of the 1820 settlers, the central and eastern part of the province is the traditional home of the Xhosa people. This region is the birthplace of many prominent South African politicians, such as Nelson Mandela, Oliver Tambo, Walter Sisulu, Govan Mbeki, Raymond Mhlaba, Robert Mangaliso Sobukwe, Chris Hani, Thabo Mbeki, Steve Biko, Bantu Holomisa and Charles Coghlan. 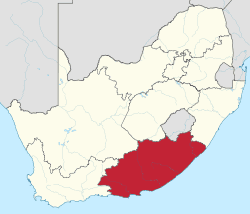 The Eastern Cape as a South African Province came into existence in 1994 and incorporated areas from the former Xhosa homelands of the Transkei and Ciskei, together with what was previously part of the Cape Province. This resulted in several anomalies including the fact that the Province has four supreme courts (in Grahamstown, Port Elizabeth, Bhisho and Mthatha) and enclaves of KwaZulu-Natal in the province. The latter anomaly has fallen away with amendments to municipal and provincial boundaries.The province is also made of Mpondo clan, which primitively descended from Xhosa clan. Some of the Mpondo clan went to this province when they were running away from King Shaka's war. Mpondo people are more closely related to Xhosa, as they use Xhosa as their main home language. The Eastern Cape gets progressively wetter from west to east. The west is mostly semi-arid Karoo, except in the far south, which is temperate rainforest in the Tsitsikamma region. The coast is generally rugged with interspersed beaches. 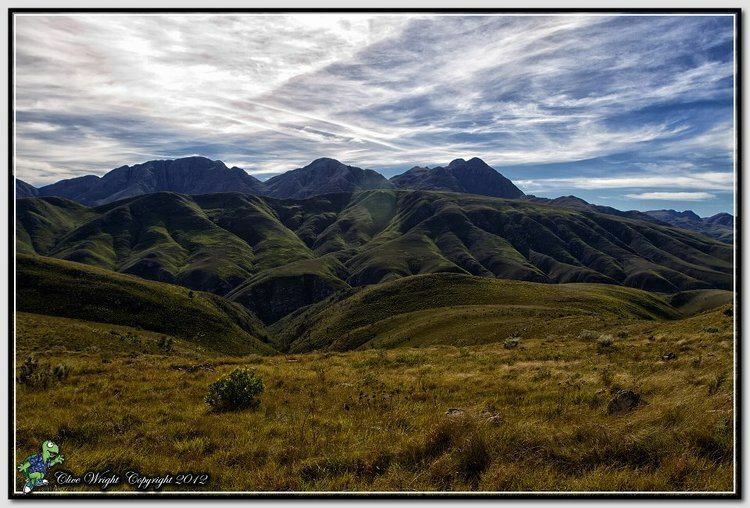 Most of the province is hilly to very mountainous between Graaff-Reinet and Rhodes including the Sneeuberge (English: Snow Mountains), Stormberge, Winterberge and Drakensberg (English: Dragon Mountains). The highest point in the province is Ben Macdhui at 3001m. The east from East London and Queenstown towards the KwaZulu-Natal border – a region known previously as Transkei – is lush grassland on rolling hills, punctuated by deep gorges with intermittent forest. Climate is highly varied. The west is dry with sparse rain during winter or summer, with frosty winters and hot summers. The area Tsitsikamma to Grahamstown receives more precipitation, which is also relatively evenly distributed and temperatures are mild. Further east, rainfall becomes more plentiful and humidity increases, becoming more subtropical along the coast with summer rainfall. The interior can become very cold in winter, with heavy snowfalls occasionally occurring in the mountainous regions between Molteno and Rhodes. The landscape is extremely diverse. The western interior is largely arid Karoo, while the east is well-watered and green. The Eastern Cape offers a wide array of attractions, including 800 km of untouched and pristine coastline along with some particularly splendid beaches, and "big-five" viewing in a malaria-free environment. The Addo Elephant National Park, situated 73 km from Port Elizabeth, was proclaimed in 1931. Its 743 km² offers sanctuary to 170 elephants, 400 Cape buffalo and 21 black rhino of the very scarce Kenyan sub-species. The province is the location of South Africa's only Snow skiing resort, Tiffindell, which is situated near the hamlet of Rhodes in the Southern Drakensberg on the slopes of Ben Macdhui, the highest mountain peak in the Eastern Cape (3001 m). The National Arts Festival, held annually in Grahamstown, is Africa's largest and most colourful cultural event, offering a choice of the very best of both indigenous and imported talent. Every year for 11 days the town's population almost doubles, as over 50,000 people flock to the region for a feast of arts, crafts and sheer entertainment. Jeffreys Bay is an area with some of the country's wildest coastline, which is backed by some of Africa's most spectacular sub-tropical rainforest. Famous for its "supertubes", probably South Africa's longest and most consistently good wave, it's charged with a surf vibe as relaxed as it is friendly, and this tends to soften the effect of the wealthy set who have made this part of the coast their own. Aliwal North, lying on a splendid agricultural plateau on the southern bank of the Orange River, is one of the country's most popular inland resorts and is famous for its hot springs. 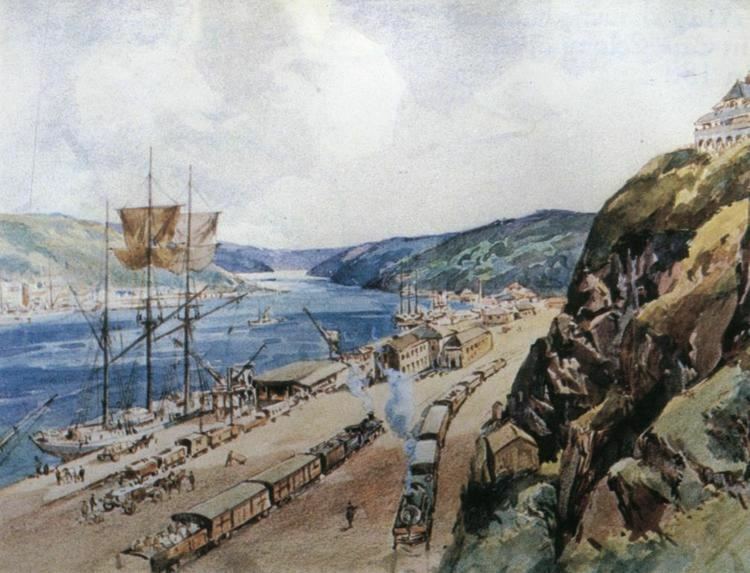 The rugged and unspoilt Wild Coast is a place of spectacular scenery, and a graveyard for many vessels. Whittlesea, Eastern Cape, situated in the beautiful Amatola Mountains,is now famous for the first wine estate in the province. The Eastern Cape is one of the poorest provinces in South Africa. This is largely due to the poverty found in the former homelands, where subsistence agriculture predominates. There is much fertile land in the Eastern Cape, and agriculture remains important. The fertile Langkloof Valley in the southwest has enormous deciduous fruit orchards, while sheep farming predominates in the Karoo. The Alexandria-Grahamstown area produces pineapples, chicory and dairy products, while coffee and tea are cultivated at Magwa. People in the former Transkei region are dependent on cattle, maize and sorghum-farming. An olive nursery has been developed in collaboration with the University of Fort Hare to form a nucleus of olive production in the Eastern Cape. Domestic stock farming is slowly giving way to game farming on large scale, fueled by the commercial benefits of eco-tourism and the lower risk needed to protect wild game against drought, the natural elements and poaching. The area around Stutterheim is being grown extensively with timber plantations. With three import/export harbours and three airports offering direct flights to the main centres, and an excellent road and rail infrastructure, the province has been earmarked as a key area for growth and economic development in modern South Africa. The two major industrial centres, Port Elizabeth and East London have well-developed economies based on the automotive industry. General Motors and Volkswagen both have major assembly lines in the Port Elizabeth area, while East London is dominated by the large DaimlerChrysler plant, now known as Mercedes-Benz South Africa. Environmental-friendly projects include the Fish River Spatial Development Initiative, the Wild Coast SDI, and two industrial development zones, the East London Industrial Development Zone and the Coega IDZ near Port Elizabeth. Coega is the largest infrastructure development in post-apartheid South Africa. The construction of the deepwater Port of Ngqura was completed and the first commercial ship anchored in October 2009. It is expected that this development will give the province a major economic boost. Other important sectors include finance, real estate, business services, wholesale and retail trade, eco-tourism (nature reserves and game ranches) and hotels and restaurants. The Eastern Cape Department of Education has been roundly criticised for poor primary and secondary education resulting from dysfunction, special interests, and issues with the South Africa teachers union, SADTU. The province struggles with a lack of schools; a lack of teachers leading to overcrowding; a lack of textbooks; a lack of basic facilities like toilets, electricity or water; and poor transport infrastructure which regularly absents and endangers learners. By 2011, basic education had so deteriorated that the national Department of Basic Education intervened under section 100(1)(b) of the Constitution of South Africa, taking control of the province's educational administration. The Eastern Cape has since been the worst-performing province educationally and especially in terms of matriculation; matriculants' results averaged 51% in 2009, 58.3% in 2011, 64.9% in 2013, 65.4% in 2014, and 56.8% in 2015. In the 2015/2016 financial year, the province failed to spend R530 million of its allocated R1.5 billion budget for education, most of it intended for infrastructure development. Equal Education's 2017 report, Planning to Fail, found a "systemic failure in Eastern Cape education". Tuberculosis and HIV are the province's leading causes of avoidable mortality, accounting for 9.8% and 5.4% of those deaths. The Eastern Cape is known for its traditional black initiation schools, which perform coming-of-age ceremonies involving circumcision and bushwhacking. These annually lead to the deaths of teenage males due to botched circumcisions, sepsis, pneumonia and hypothermia.